The landscape here, as in all of Plymouth County, is of glacial origin, and consists of sand and gravel deposits shaped by glacial melt waters. The retreating glaciers scattered large boulders of granite at the southern corner of the preserve. Deposits of rusty-colored bog ore, which can still be seen along the brook, were sources of iron for colonial settlers. Until the end of the nineteenth century, the two ponds at this site provided water to run machinery for industrial ventures. Traces of these activities are still visible on the preserve. 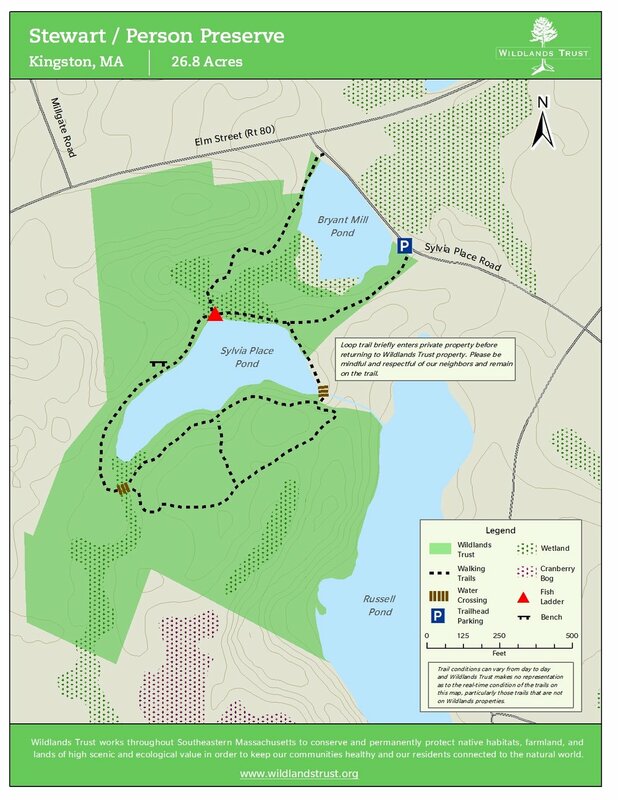 Located between Sylvia Place Pond and Russell Pond in Kingston, the Person Preserve consists of 13.5 acres forested with white pine and mixed oaks. The Person Preserve directly abuts the Stewart Preserve, sharing much of the same terrain, dominated by several eskers, formed thousands of years ago by deposits from glacial melt waters, resulting in many steep sided hills. The esker along the west edge of Russell Pond is especially steep, while other areas of the property have more gentle slopes with flat-topped hills. The hydrology of the area has been significantly altered by man over the centuries. Sylvia Pond and Russell Pond, as well as several other nearby ponds, were constructed in order to supply several downstream mills with power. Russell Pond currently flows into the eastern end of Sylvia Place Pond, which in turn flows into Bryant Mill Pond, and then into Soule’s Pond. From Soule’s Pond, water flows into Furnace Brook, then into the Jones River, emptying into Kingston Bay. Due to the diversity of habitat on the Person Preserve, a wide range of wildlife may be seen here. A large buck has been observed in the “valley” between eskers. Fish in the ponds attract both birds and mammals: osprey and great blue herons have been observed fishing in Russell Pond, and otter scats and slides were observed along the brook flowing into Sylvia Place Pond from the south. Rt. 3 to Exit 9. Go north on Rt. 3A about ½ mile, turn left onto Rt. 80. Proceed to stop sign, turn left, and continue on Rt. 80. Sylvia Place Road is on the left. On Silvia Place Road, just past the pond on the right.